A circus act featured at two Nevada casinos has been cited by the U.S. Department of Agriculture for mistreatment of its big cats. Dirk Arthur's Wild Magic show, an act featured at two Harrah's casinos in Reno, outside Las Vegas, was named for declawing lions and tigers, keeping a snow leopard in a rusty cage, chaining a bobcat in a dangerous way and for cramped cages. According to AP, a spokesman for Caesars Entertainment Corp., which owns the casinos, said the company is taking the matter seriously. "As soon as we were made aware of the issues, we informed Dirk Arthur he must address and correct them, which he has been actively and diligently doing," spokesman Gary Thompson said. Animal rights advocates are calling for people to boycott the shows, which feature illusions and big cats. "These sorts of citations are the industry standard for people who profit from these shows," said Carney Anne Nasser, an attorney for the PETA Foundation. 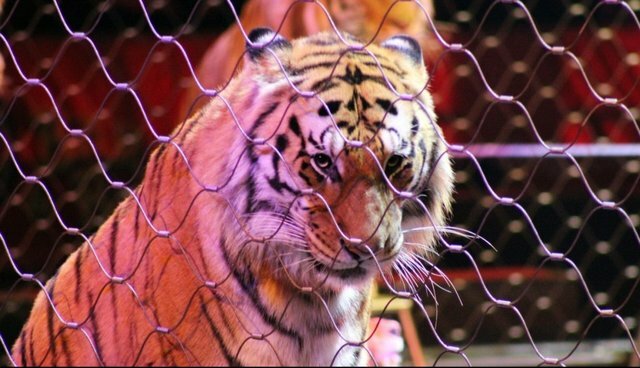 "Big cat exhibitors are notorious for simply warehousing tigers and other cats in transport cages that are barely bigger than their bodies, and totally disregarding the USDA requirements that they set up exercise areas." Animal advocates have also noted that declawing -- a technique used in circuses in the past to prevent human injury but no longer popular -- is in violation of USDA regulations, which state that the procedures "can cause ongoing pain, discomfort, or other pathological conditions in the animals." Similar shows have come under fire in the past both because of concern for the animals and for the humans involved, especially after the mauling of Roy Horn of the Siegfried & Roy nightclub. Horn was left with severe injuries after being attacked by a tiger named Montecore during a Las Vegas performance. Experts say that working with dangerous animals like tigers is a bad idea both for the trainers and for the animals, citing the fact that tigers, along with elephants, are the main causes of occupational fatalities for circus workers and zoo keepers in the USA. There have been many examples -- from around the world, throughout human history -- of animals abused in circuses. Beyond that, few can even try to argue that having animals perform in circuses is ethically defensible. We won't, either. An increasing number of countries -- including Greatt Britian, The Netherlands, Greece, Bolivia -- are banning the use of either wild or all animals in circuses. Born Free USA offers a helpful primer on circus problems here; if you want to become involved in activism against circuses you can find a step-by-step guide from Born Free USA here. Peta, which has probably led more circus investigation than any group, offers ways to become involved here.